TurboTax Desktop or TurboTax Online? Most people are familiar with TurboTax, which is the top personal tax preparation software in the U.S. What many people don’t know is there are two ways to use TurboTax. 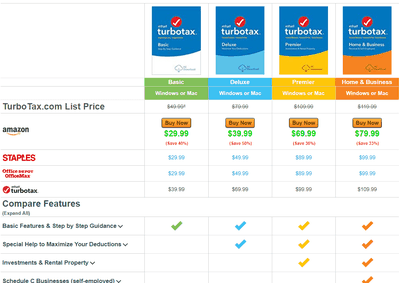 The online version at TurboTax.com, and the desktop version, which you install on a PC or Mac. What’s the difference between TurboTax Desktop and TurboTax Online? One return for each sign-in. Form 1040-EZ or 1040-A with standard deductions and no state or add-ons is free with TurboTax Free edition. Efile up to 5 family or personal returns. Try before you buy, pay for TurboTax plus or Deluxe and above when you efile or print your return. Buy before your try with a 60 day money back guarantee! Each state is extra and includes efiling. One free state is usually included with Deluxe, Premier, & Home and Business editions (each state efile is extra). Can efile one federal and up to 5 state returns. Efile up to 5 federal returns, each with up to 3 state returns. Online system requirements are usually lower, a current browser and internet access should be good. System requirements are usually higher, see Windows requirements or Mac requirements. TurboTax securely handles storage and backups (pay for TurboTax Plus or Deluxe and above for access to prior tax year returns). You manage your own stoarage and backups. Prepare and file taxes from any Internet device. Even smart phones, iPads and tablets! Check out our new mobile apps for iOS and Android. TurboTax requires a Windows or Mac computer system with Internet access for program updates, help articles, and efiling. TurboTax Online is always up-to-date; you see the latest forms and tax information. The latest upates will load when you access the internet. Requires a unique User ID and password for each return. And you must remember it from one year to the next to access last years tax information. Tax files are available as long as you have a computer and the program, and you keep your tax files (remember to keep backups). Whichever you decide to use, TurboTax Online or TurboTax Desktop, you’ll be using the best tax preparation software available to ensure you get the biggest refund and save the most on your taxes. Quicken 2016 New Features – Really Intuit? How do you file a Turbotax return with W2s, etc.? 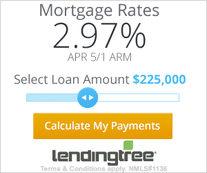 TurboTax will prompt you to enter all the information on your W2 into the TurboTax program. It will then send that information to the IRS along with your tax return. Can Turbotax determine which portion of my dividends for a particular stock or mutual fund are considered qualified dividends or not for me? I can provide purchase and sell dates. Typically your 1099-DIV should list the amount of your dividends that are qualified. TurboTax will prompt you to enter this amount when you are entering the information from the 1099-DIV. Deluxe and all desktop versions of TurboTax does include all the forms, so you can use Deluxe as long as you are comfortable filling out the forms and schedules yourself that are required to report your investment income. Premier provides additional help with filling out the forms. Which 2016 Turbo Tax Do I need? Also my internet is ATT. Should I use cd or download version? I would recommend TurboTax Home & Business to make sure you get all the guidance you need for the Schedule C. It will also cover the other items you mentioned. The download is not too big (about 116MB), so I would recommend going with that so you don’t have to wait for a CD to come in the mail. I am going to do my daughter’s return as well as my own. I would like to do her return on her computer (a MAC) and mine on my computer (a PC). Do I have to buy two separate comes of Turbotax or can I use one Turbota X on both a MAC and a PC? 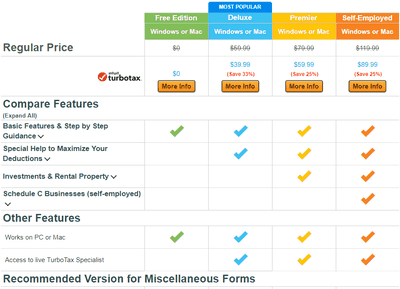 You would need to buy two separate copies of TurboTax because it comes as either Windows or Mac. I would suggest just doing her return on your computer. You can e-file up to 5 federal returns with your copy of TurboTax from your own computer. You can get the latest TurboTax for either PC or Mac here. New to Turbo tax. Should I purchase the Deluxe or Premier CD version to file Schedules A, B and D? 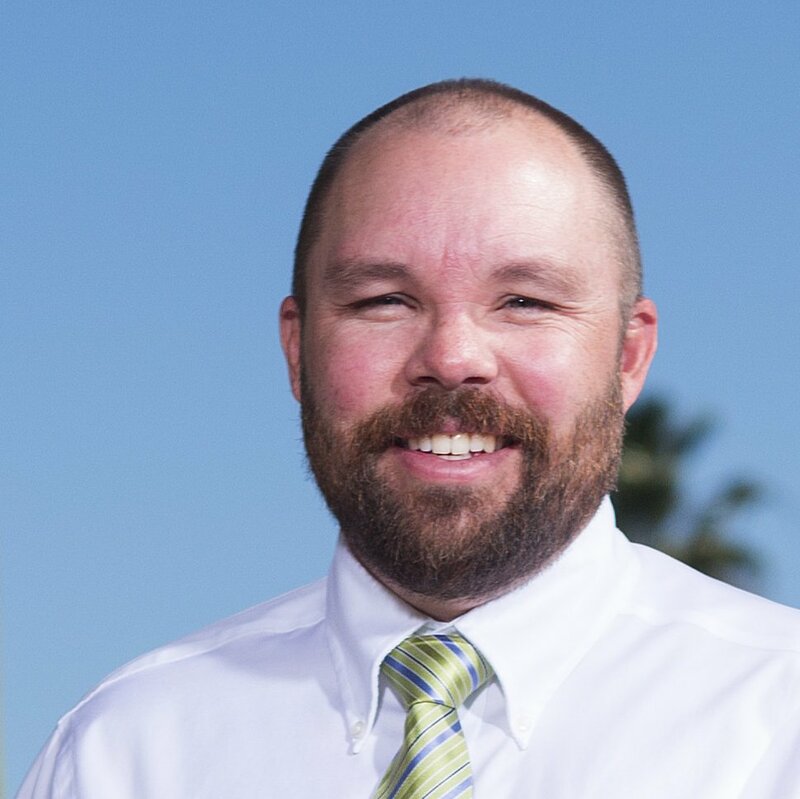 I would recommend Premier if you have investments with capital gains. It will give you more specific guidance for filling out the Schedule D. If you are comfortable with filling out Schedule D on your own, Deluxe includes it, but without the additional guidance. I had foreign employee income this year. Which turbo tax will be able to address it? I would recommend TurboTax Deluxe. The requirements for TurboTax 2016 are 650 MB plus up to 4.5 GB for Microsoft.NET 4.5.2c, which is frequently already installed. If I purchase Turbo Tax Deluxe and Download it, can I make a copy of the download and load it into my daughters computer in addition to my PC? How many computers can I use it on? Yes, the TurboTax license allows you to install it on all the computers you own, so that would be fine. We have almost always used TT Deluxe, except when we moved to another state and bought/sold houses–we used a paid preparer for that year. We have investment income, dividends and high medical expenses–will Deluxe do the same thing for us, or do we need to go to the next step? If you have investment income, I would recommend TurboTax Premier instead. It will provide additional guidance related to the investments and help you with filling out the correct forms. You can check out the latest prices at here. Is there a Turbo Tax product where I can do more than 5 efiles? No, this limit is imposed by the IRS, not TurboTax. The IRS only allows a person to e-file up to 5 returns unless they register as an authorized e-file provider with the IRS. TurboTax will, however, allow you to file an unlimited number of returns if you print and mail them. I used download this year for the first time. Unlike previous years with a purchased CD I was unable to access “forms” either for a new form or to see the progress of one of my partially completed forms such as schedule A or even 1040. I was also unable to “override” Turbotax with a “right click” but perhaps this was due to my new use of a MacPro. Only after I paid for the download version did a Google search reveal that “forms” access is not available on the downloaded version. From now on I will only use the CD version. Tom, the downloaded version and the CD version are exactly the same. The only difference is whether you have to wait for it to arrive in the mail or download and install it right away. In either case, the product is exactly the same after you install it. I’m wondering if you’re having problems due to your new Mac? Which product do I need to file my business expenses of form 2106. Form 2106 is for employee business expenses. You can use TurboTax Deluxe or higher.